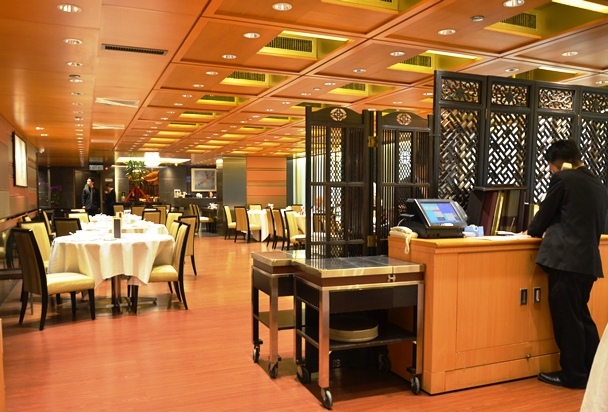 Fook Lam Moon or 福臨門 has an illustrious reputation of being dubbed the 'Cafeteria for the Wealthy' as it is a Chinese restaurant frequented by the rich and famous. Fook Lam Moon literally translates to 'fortune and blessings arriving at your doorsteps'. 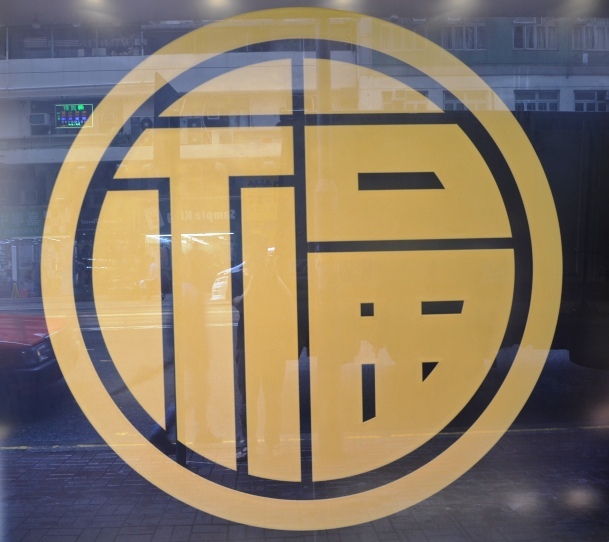 The restaurant started in 1948 as a catering service provider for the elite of Hong Kong who threw lavish parties at home. It was known as Fook Kee before renaming itself to Fook Lam Moon upon taking up a customer's suggestion in 1953. To the customers, it always meant good fortune when Fook Lam Moon chefs showed up at their doors since it was a promise of good food. 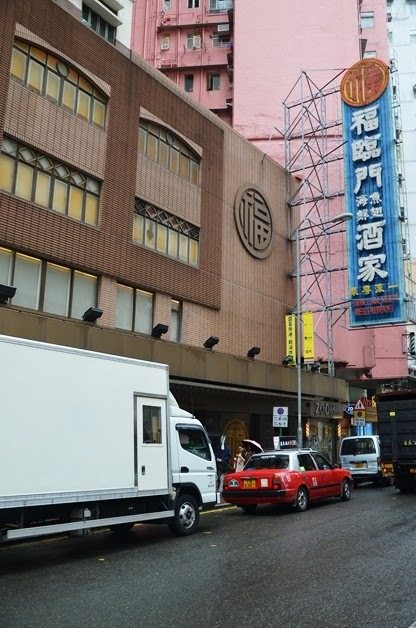 Hall dining in the form of a restaurant was first introduced in the 1970s and in 1989, the restaurant expanded business and moved to its current premise on Johnston Road at Wanchai. 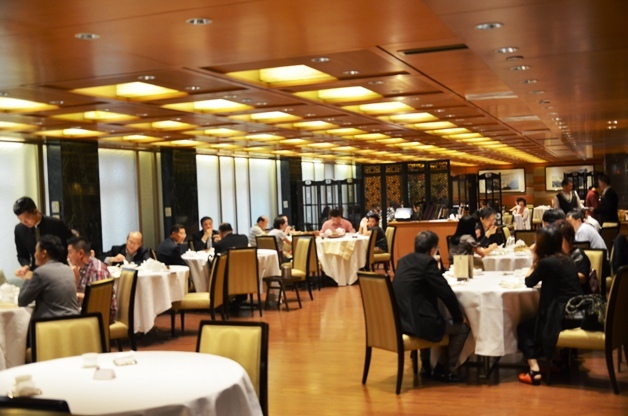 Listed in the Asia's Top 20 Restaurants of the Miele Guide, the original restaurant at Wanchai was previously awarded with Michelin 2* while its branch at Tsim Sha Tsui bags 1*. With reference to the recently published Michelin Guide 2013, it seemed that both branches have an equal standing of 1* each. What appealed to us strongly was the underlying philosophy behind Fook Lam Moon's success - a simple fact in using only the best ingredients. The chefs at work were of the opinion that no matter how talented a chef might be, the food would never impress without the use of stellar ingredients. Admittedly, it was with a high level of expectation that we set foot to Fook Lam Moon. Can it still impress our picky palate? The ground floor was used as a lobby or rather waiting area for diners. There were two receptionists who would communicate with the manager at the restaurant to facilitate an orderly fashion of ushering customers to their tables on the upper floor. When a table was ready, the lady would send you in one of the two lifts to the 1st floor. It was truly an experience of exclusivity as you would not expect to share a lift with other diners. It was no joke when the media label this place the Cafeteria of the Wealthy. The interior of the restaurant was posh and classy. There were a few elders who visited after us and they were politely greeted by their surnames and shown to their usual table. There were wooden side stools at each table, thoughtfully placed for diners to place their bags and belongings. To be completely honest, I felt rather intimidated as the servers, who were mainly males in their 40-50s, were rather mercenary. Yes, we did not show up dressed like we were filthy rich but while the service was professional, it lacked warmth and heart like our experience at Dim Sum Square. It came across as too commercial for my liking. The service was immaculate where the basic duties were all duly executed and it was easy to fetch their attention but somehow I felt like I was constantly being judged. 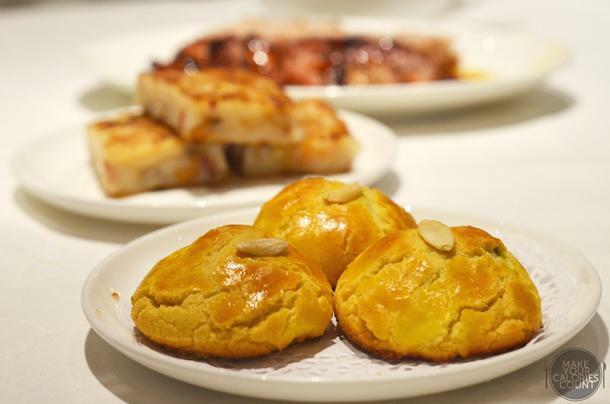 The dim sum dishes were divided by the methods of preparation namely steamed, deep-fried, specials and desserts. 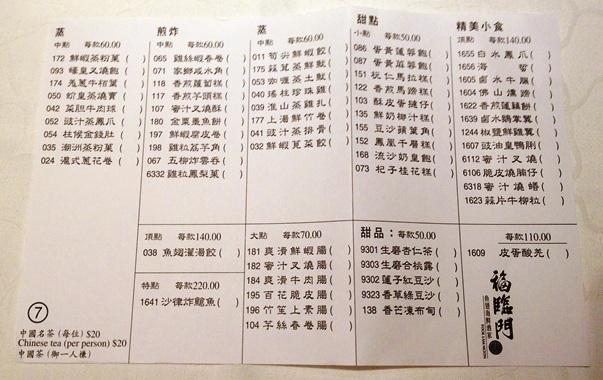 Each dish ranged between HK$50 - HK$140 and Chinese tea was served at HK$20 per person. The 铁观音 tea we ordered was rich and fragrant and premium tea leaves were used which gradually grew in size after being submerged in hot water. The tea-pot also had an internal filter to block out any loose leaves, leaving each cup of Chinese tea clean. 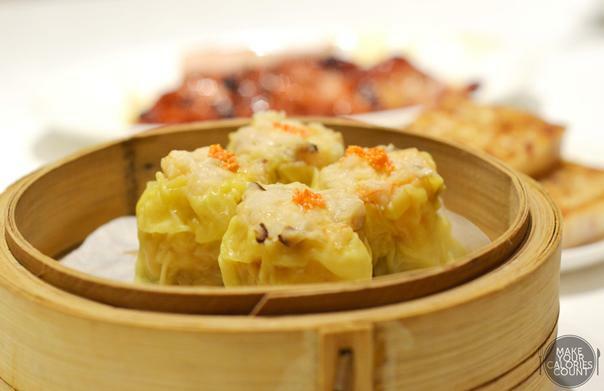 In the world of dim sum, I always think that three dishes must be present on the table. They are like BFF and one cannot exist without the other and they are none other than har gaw, siew mai and lo bak go. 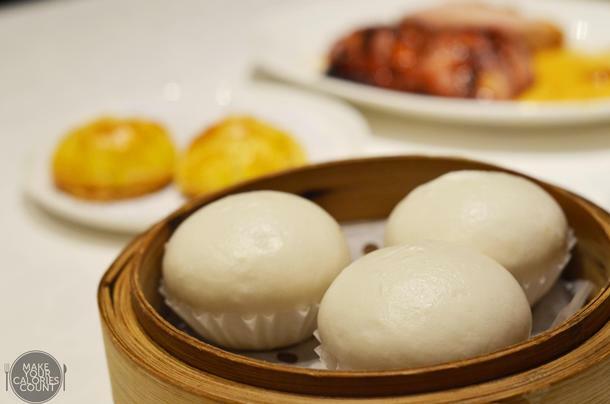 On that basis, this simple yet classic dim sum had to be featured. It was done perfectly, pan-fried to a crisp surface and mashy soft on the inside which could melt in your mouth. The radish tasted really smooth and on its own, carried a hint of subtle fragrance. Certainly a class of its own. 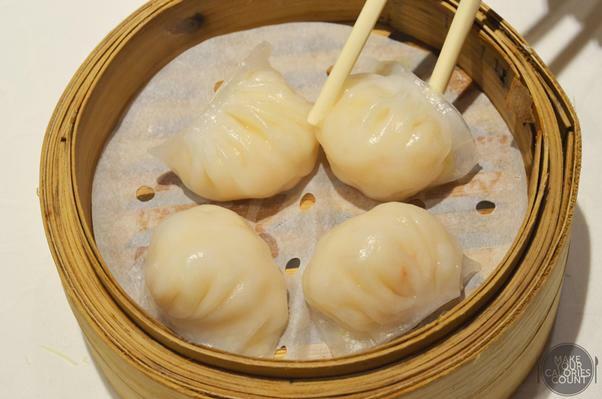 Thinly wrapped by a translucent dumpling skin, it packed a punch of texture with the fresh succulent prawns which were moist with a slightly firm crunch. What we enjoyed about this simple har gaw was that the main ingredient, prawns, were fresh unlike the typical poor grade crunchy prawns typically used for the dish. Flavour-wise, it tasted rather bland and mild but this allowed the natural sweetness of the prawns to shine. For those who crave for a strong flavour, I suggest requesting the XO chilli oil sauce from the servers. It is not usually offered but this sauce blew us away with a perfect balance in savouriness and heat. The pork used was fresh which did not have that appalling porky taste and the seasoning to it was light and bland. What fell apart for the dish, literally too, was the thin dumpling skin which was sticky and failed to hold the dumpling firmly together. For those who hold their chopsticks poorly like myself would soon find their siew mai either sticking to the cutlery or broken apart. It certainly did not par as well as its BFF on this instance but apart from the skin, we enjoyed every single bit of this innocent-looking dumpling. It was our first time trying this type of pastry which was quite unlike the usual char siew sou available at dim sum restaurants. The pastry was butter rich and crumbled like cookies rather than the flaky renditions. 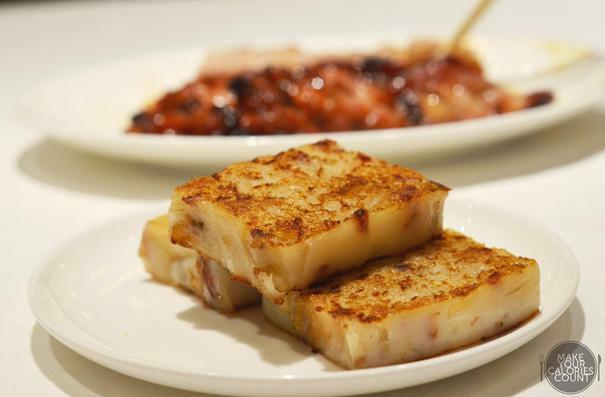 The barbecued pork on the inside was finely diced and beautifully seasoned to give a mild sweetness. The choice of cut for the diced barbecued pork was brilliant, with just the right amount of fat to keep it moist and juicy. 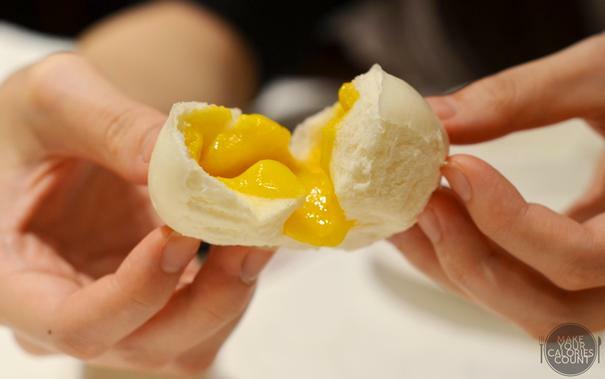 This steamed salted egg yolk custard bun scored perfectly in all areas and is currently our top-pick having tried the numerous dim sum restaurants in Hong Kong and Singapore. The bun was fluffy and light with a right amount of chewiness to it. 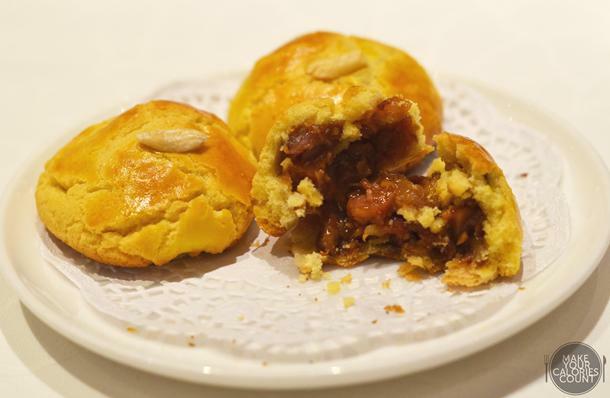 The bun served more like a soft encasing to the warm, rich and dense filling on the inside. As we lightly tore it apart, the generous filling oozed out in plentifulness and it was simply a joy to watch that viscous yellow custard flowing. The flavours were beautifully balanced with just the right amount of sweetness and saltiness to match. We simply could not get enough of these! Halfway through the dishes, I had a sudden craving for roast meats. Between the two of us, we thought it would be wise to request for a halved portion of both the barbecued pork (char siew) and roast pork (siew yuk) and they gladly accepted the order! Individual portions of the char siew and siew yuk were priced at HK$200/- each but a mixed platter came at the same price. We are constantly on the hunt for the best char siew and siew yuk, be it in Singapore or Hong Kong. Our top siew yuk used to be from Yung Kee and after trying this, we were left divided about which was the best. 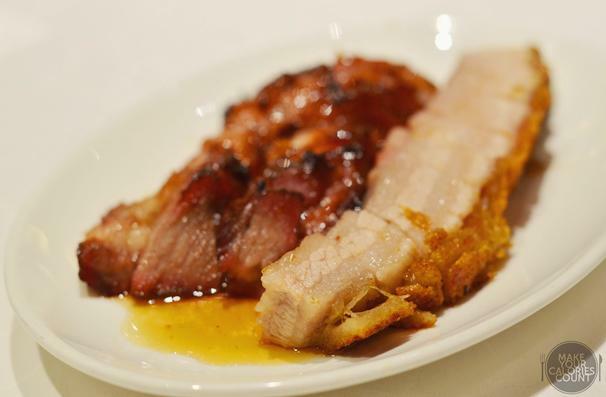 Both eateries chose the best cut of the pork belly which had clearly defined layers of fat and leaner portions topped with a very crispy skin which gave a beautiful crackling. Served with mustard, it was sublime and the quality of the mustard at Fook Lam Moon certainly held a winning edge over Yung Kee. The char siew had a good mix of the juicy fats and it matched our palates nicely. It was coated with a rich layer of honey and beautifully roasted to give a succulent taste without dehydrating the meat. 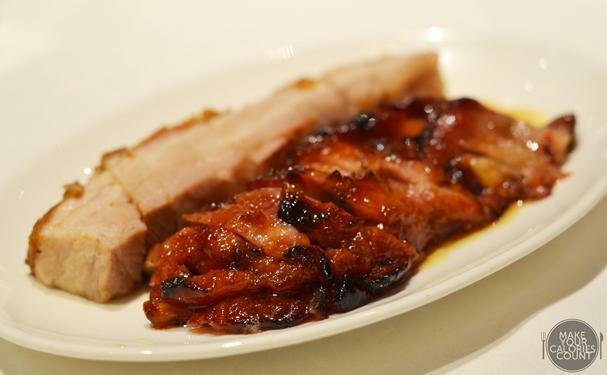 It was easily one of the best char siew we ever had! We waited for more than 30 minutes and the egg tarts were still not served. Apparently the order was neglected and the manager attended to it immediately. 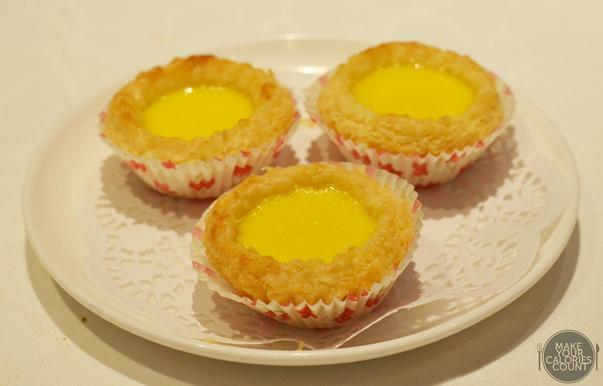 The egg tarts, like the rest of the dim sum, were made to order so we waited an additional 15 minutes or so for these to arrive. The flaky pastry was one of the finest we had seen. Freshly baked, the pastry literally melted in our mouths with a rich buttery after-taste which left me reminiscing even at the point of writing! Unfortunately, it lacked a strong enough egg taste and flavour to pair with that beautiful pastry which held the filling. The servers were really attentive and waited till the savoury dim sums were finished before sending us the dessert to round up the meal. 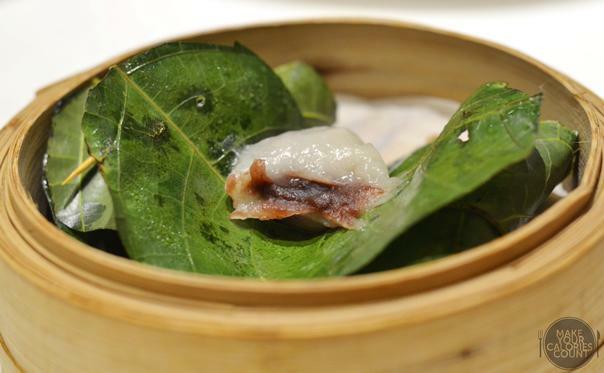 The glutinous dumpling was slightly sticky and chewy. I struggled with my chopsticks so I unglamorously used my hands to pry the fragrant leaf apart before indulging on the red bean dessert. We enjoyed that the red bean was fine and smooth and not overly sweet. 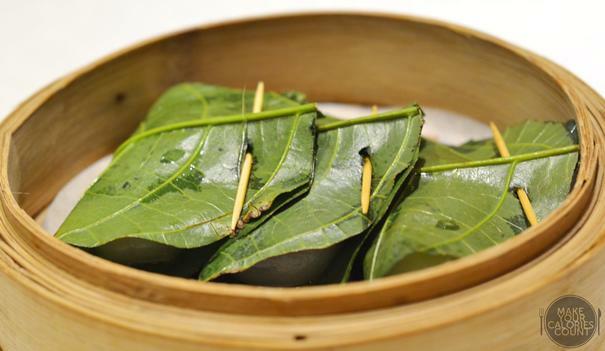 The glutinous dumpling also had a hint of the fragrance from the apple leaf. It was a good sweet treat but I would have preferred it more if the glutinous dumpling was not as sticky. Overall, the quality of food was good and to some extent, exceeded our expectations. I did not feel comfortable with the service as mentioned earlier but it might have been my own consciousness acting up. 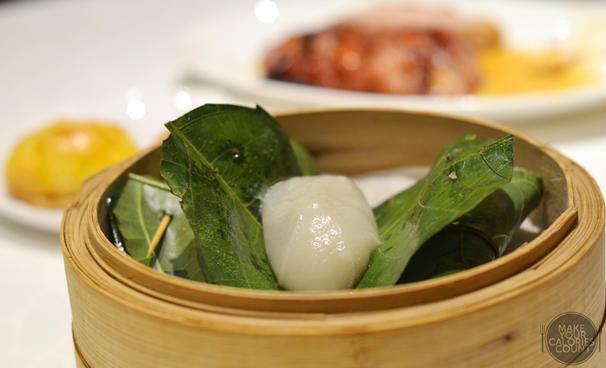 The bill certainly did not come cheap for a dim sum meal but given the quality and experience, we felt that it was worthy of its Michelin star. We would highly recommend to call in advance to place reservations be it for their dim sum or ala carte Chinese dinner in the evenings. The tagline of Cafeteria for the Wealthy for Fook Lam Moon seemed appropriate for each dish was easily double the price that of a normal dim sum eatery in Hong Kong. For the commoners like us, it would certainly be quite a meal to remember!